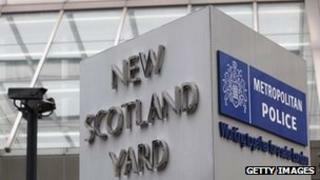 The Metropolitan Police has paid out £8.9m in compensation over six years to settle complaints over police actions. In 2010-11, the Met paid £1.8m for 205 claims, figures have revealed. In one case in 2009, a barrister said he struggled to get an apology after he went into a diabetic coma when an officer took his insulin following a wrongful arrest in London. The Met said it invested "significant resources" to ensure the professional standards of its staff. The figures, obtained by the BBC under the Freedom of Information Act, show that in 2010-11, the Met paid £1.1m in 72 settled civil actions; almost £600,000 in 128 settled threatened actions and £48,000 in five court awards. In 2009-10, the force paid nearly the same amount in settled civil actions and court awards, however it spent £100,000 less than 2010-11 on settled threatened actions. The Met said as the amount of time it takes to settle a claim varied, it was not possible to say whether there were any trends such as an increase in payouts. Barrister Colin Challenger said it took him one-and-a-half years to receive an official apology which was printed in the Solicitors Journal and in the High Court daily list after his wrongful arrest in 2009. He also received a reported £100,000, which he gave to charity. Mr Challenger had been arrested outside the High Court after officers mistakenly thought he was a protester who was breaking the law. He said the complaint process was very difficult, adding that even he struggled despite his 40 years' experience as a barrister. "I was able to seek an apology as I knew who to go to in terms of solicitors; I could afford to pay them if I needed to," Mr Challenger said. "An ordinary man in the street would find it very, very, difficult indeed." One of the difficulties he had was that he did not realise taking legal action against the Met did not constitute as an official complaint and that had to be filed separately. He said the experience made him want to "burst into tears" and had completely changed his view of the police. Shamik Dutta, a lawyer at Bhatt Murphy who has successfully represented a number of individuals in claims against the police, said where the police complaints system had failed, victims were often forced to take legal action to secure an apology. "It is not unusual for the commissioner to pay damages and apologise in cases where failures in the police complaints system nevertheless allow the officers involved to keep their jobs," he said. Mr Dutta said the figures did not deal with the amount of money the commissioner spent on his own lawyers in defending claims of police misconduct. "An effective police complaints system would save tax-payers money," Mr Dutta said. He said victims, particularly those who had suffered psychological trauma, often struggled to come forward due to the stress of litigation so the number of cases publicised could be the tip of the iceberg. "It's very rare for officers to give evidence against their colleagues," he added. "Nothing will change until there is an effective police complaints system and until officers are ready to give evidence against colleagues who are guilty of misconduct." A Met spokeswoman said complaints were investigated by the Directorate of Professional Standards (DPS) who looked at 6,603 complaints last year. She said the DPS apologised when officers were found to be in the wrong. "The majority of these apologies are done at a local level following discussion with the complainant and the officer/s concerned," the spokeswoman said in a statement. "It is important people have faith in our investigation process and we would encourage anyone who feels we have fallen below the standards expected of us to make a complaint which will be investigated."